What could be better than a North Shore retreat, nestled in the woods of Northern Minnesota? We finished out the interior of an amazing timber frame structure, making the stairway entrance a focal point of this haven. Using a mix of classic and modern Scandinavian design, we created a cozy space with warm woods and hand-finished metal accents. 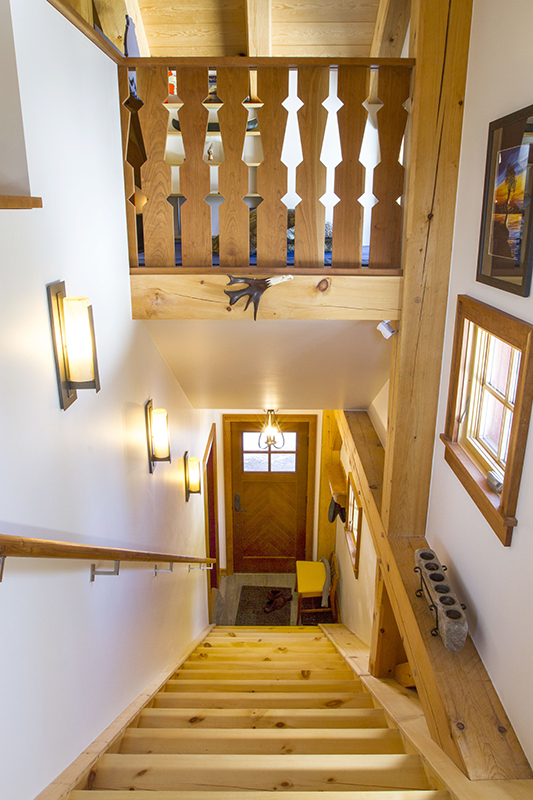 Here we offer a glimpse of the stairway, which leads from the ground floor entry to a light-filled getaway. 14 giant steps (locally grown and sustainably harvested white pine) lead from the ground level entry of this timber frame to the haven apartment above. The custom steps were created for the space by Minnesota Timber and Millwork (MTM), part of Rajala Companies. John Rajala carries on the third generation of tradition, focusing on sustainably harvesting locally grown species of wood. Rajala saws all harvested wood in their historic mill in Big Fork, MN–the longest continually running saw mill in the state. Rajala continues conservation efforts begun by Jack Rajala in the early 70s. You can read more about those visionary efforts here. View looking down the steps towards the cherry door that Andy built. 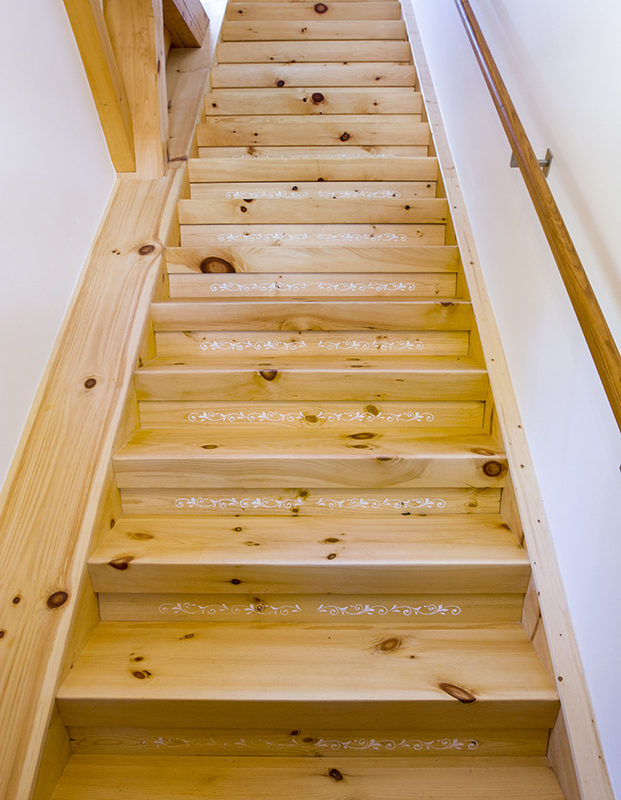 Each of these giant white pine treads measures 4 inches thick and 12 inches deep. We used Rubio Monocoat in clear to preserve the golden hue of the pine. Now take a closer look at the risers. The delicate stencil pattern draws the eye up the stairs to the airy apartment haven above. The charming detail hints at Scandinavian scroll work design which is echoed throughout the living space. 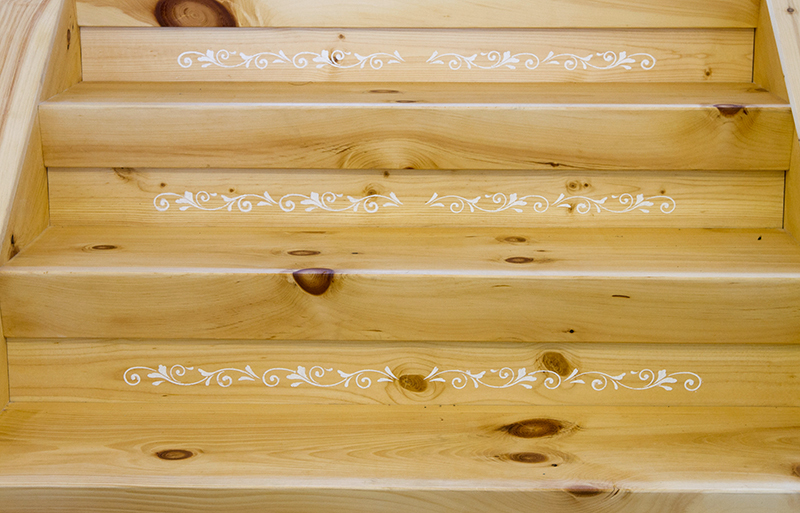 Scandinavian stencil work design on the white pine risers hints of the Scandinavian scroll work elements found in the apartment above.